Gemma Juliana: My Muse Is Back! This blog post could be about how an author tried to live a normal life when her muse abandoned her for an entire year. Instead, I’ll focus on the positive. She and I renegotiated our contract and she is back on the job! She demanded that more play time, more chocolate, more aromatherapy bubble baths, and an occasional glass of champagne are added to her contract. She also insisted ‘we’ travel more for inspiration, even just a day trip at times. She’s tired of humdrum routines and old patterns. Who am I to say no? So, we’re back in the writer’s chair and enjoying it more than ever. To kick it all off, we’re in three anthologies—two are releasing right now, with the third in November. And then there’s a fourth that is in the early stages of planning for Spring 2016. I’d never been in a multi-author boxed set before but am loving it. There’s something special about joining up with author friends and shooting for the stars in a group effort. Thanks so much from us all! My novelette, Riviera Rendezvous, takes us on a fast ride in a shiny sports car with the mysterious and magnetic Xandros Xenakis from Genoa, Italy—where Amalie Pallas abandons ship after a scary encounter—to a fairytale wedding in the sleepy town of Èze on the French Riviera. 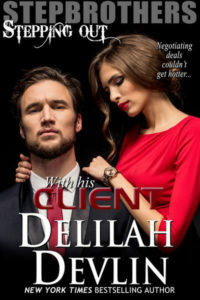 She’s a damsel in temporary distress; he’s a knight in a shiny Aston Martin coupe with the perfect solution—a win-win offer she can’t afford to refuse. Can a weekend turn into a lifetime? The second boxed set is of a totally different nature. 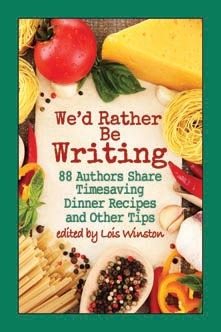 It’s a compilation of recipes and tips from busy authors. It’s available now for pre-order on several platforms and will be available in both ebook and hard copy. Can’t beat it for .99 and a portion goes to charity. What a fine gift this holiday season. 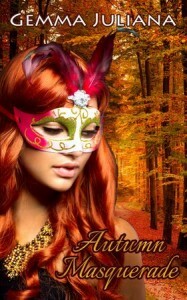 Last but not least, please take a peek at Autumn Masquerade, my autumn story that works for Halloween, Thanksgiving, and the harvest season in general. Anna Spencer learned long ago that she must separate her corporate career and her psychic gifts. Her boss is the one person she fears will find out. Richard Bentley, a wealthy widower, has come to mean more to Anna than she wants to admit. When Anna agrees reluctantly to fill in as a psychic at a masquerade ball, her secret world collides with her daily reality. Communicating with the dead is her greatest gift, and lands her in a huge predicament when Richard’s deceased wife shows up for a chat. Thanks for listening to my shameless self-promotion! I wish each and every one of you a delightful season of gratitude and reflection, and lots of reading and writing! GEMMA JULIANA is a multi-published author who writes love stories of all kinds, from contemporary to paranormal. She has a penchant for romantic international settings, whether real and fictional. 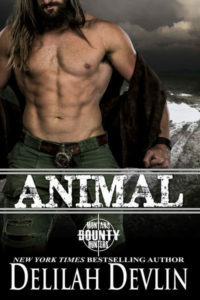 Gemma lives in a cozy cottage in Texas with her very own hero, teen son, and a dog who rules them all. Chocolate and coffee nourish her muse and fuel her creativity. She enjoys traveling for research and spending time with family and friends. Gemma loves hearing from readers and making new friends.